1. 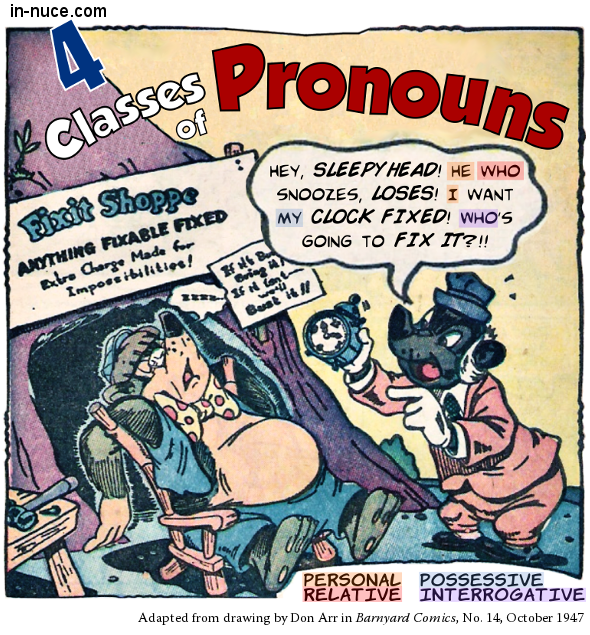 A personal pronoun shows the person of the noun it represents. a. The words “I,” “you,” and “he ” are pronouns, because they take the place of nouns. b. “I” denotes first person, because it indicates the person speaking. c. “You” denotes second person, because it indicates the person addressed. d. “He” denoted third person, because it indicates the person spoken of. Those words which show by their form the person of the nouns they represent are called personal pronouns. 2. A possessive pronoun indicates possession. a. “My” stands for the possessor. b. Two words could be used instead of “mine”. “Mine,” then, stands for both the possessor and the thing possessed. We call it a possessive pronoun. 3. A relative pronoun does not change its form to denote person, but relates to some noun. The man who was with me is a lawyer. a. In this sentence, “who” stands for “man,” and therefore represents the third person. It does not change its form to denote person, but relates to some noun. c. A relative pronoun must be of the same person and number as the noun to which it relates. d. It should be placed as closely as possible to its antecedent. He who runs may stumble. 4. An interrogative pronoun is used to ask a question. Who has lost a pencil? The pronoun “who” is here used in asking a question. We will call it an interrogative pronoun.